Yes, you can. Of course, make sure the area where you pray inside the bathroom is clean enough; sit or stand within a clean location (i.e., away from the sight and smell of excrement and urine). You can even pray while sitting on a clean, closed toilet. Your focus should be on praying within reverence, piety, and the fear of the Lord God while adhering to piety all day long within your behavior. The Lord God says the following in the Quran: "Your Lord would never destroy the towns wrongfully, while their inhabitants are righteous." (11:117); "God commands justice...And He forbids immorality, and injustice, and oppression. He advises you, so that you may take heed." (16:90). The words of Moses are part of Quranic stories; they are NOT Quranic legislations. Moses was so furious that he commanded his people to show repentance and atonement by killing themselves: "And recall that Moses said to his people, "O my people, you have done wrong to yourselves by worshiping the calf. So repent to your Creator, and kill yourselves. That would be better for you with your Creator." So He accepted your repentance, for He is the Accepter of Repentance, the Merciful." (2:54). It seems that his command to them was about to get a favorable response from them, as they sought to purify themselves from this grave sin of polytheism they had committed and they regretted it very much, within deep remorse: "Then, when they regretted, and realized that they had erred, they said, "Unless our Lord extends His mercy to us, and forgives us, we will be among the losers."" (7:149). This is why God has accepted their repentance and they did not have to kill themselves: "...Then they took the calf for worship, even after the clear proofs had come to them. Yet We pardoned that..." (4:153). We thank you for your optimism; we sincerely hope to be able to visit Egypt for one week to see our beloved relatives, friends, etc. whom we have never seen since 2001; we are 70 years old and are about to die. We are not afraid of anything or anyone; yet, we cannot visit Egypt unless a formal invitation is sent to us by the Egyptian government; this will preserve our dignity. It is a shame that a thinker of our caliber, whose school of thought is the peaceful solution to defeat (once and for all) the Wahabi terrorism and extremism which threaten and endanger Egypt, cannot visit his homeland and is forced to live in exile. We are not bragging here: We have spent our life (i.e., more than 40 years) defending Islam and Egypt. It is a shame that ignorance, obscurantism, and extremism are rampant in Egyptian mosques and media until now. It is a disgrace that our person is forced into exile while the Egyptian government celebrates the visits of the Saudi high-rank clergymen of Satan. 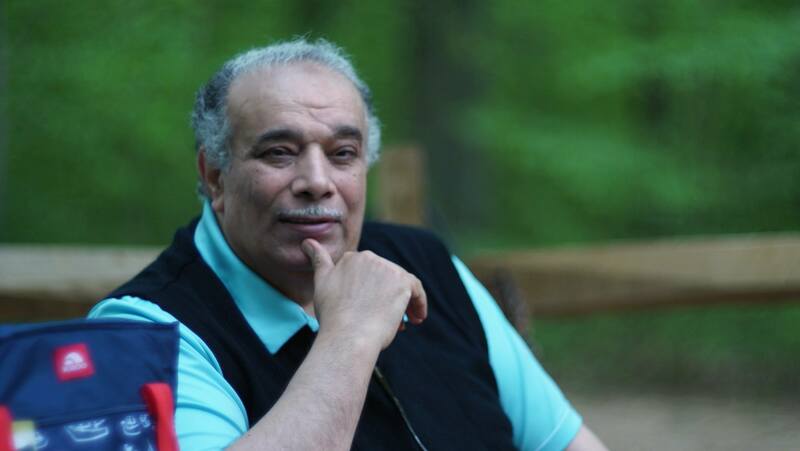 We are not exaggerating here: No other Egyptian or Arab reformist thinkers ever managed to produce the quality and quantity of our writings and our thousands of innovative ideas. It is a shame that media blackout is still imposed on us; the Egyptian media rarely mention our name or refer to our writings about peaceful religious and political reform. Our reward rests with the Lord God. The Lord God is Sufficient for us. All acts of worship are imposed by the Lord God on those males and females who attained puberty and not before this stage. They are performed willingly by pious people without coercion or being watched by others; only the Lord God will judge human beings in this respect: "There shall be no compulsion in religion..." (2:256). Children are mentioned in the legislations found in the verses 24:31 and 24:58-59. It means to change submission to tyrants' injustices and humiliation and to stop deifying things and mortals (esp., rulers and clergymen) in order to adhere to the Quranic higher values: justice, opposing injustice, courage, freedom, dignity, etc. True monotheists fear no one and nothing; they fear only their Lord God Allah Who preordains fates on humanity; the pious ones perform good deeds and help everyone. If a given nation would let go of the culture of slaves, realize they are not a herd of cattle, and seek to uphold justice, no tyrants can humiliate, control/ride, and torment them. Thank you our son for your good question. We have quoted some lines of this great poem because we yearn and long to visit Egypt: our original homeland; so far, we cannot venture to go there lest we may get persecuted and/or incarcerated; we left it to avoid persecution and we had to seek political asylum in the USA. The great poet Ahmed Shawki composed this poem about Egypt while he was exiled in Spain by the command of the British colonizers; he spent several years there before being allowed to return to his beloved Egypt; he uses very beautiful similes and hyperboles; Egypt to him was dearer than Paradise; this hyperbole incurred the wrath of some conservatives of his time. Ahmed Shawki was a true Egyptian despite his Turkish and Circassian roots. The sense of belonging to Egypt is not merely linked to being born there; it is all about loving Egypt with all one's heart, while appreciating its millennia-old civilization, history, and glory. Some pharaohs/tyrants who ruled Egypt were of Egyptian origin and some were of non-Egyptian origins; they were the worst enemies of Egypt and its great nation; those tyrants never belonged to Egypt. Ahmed Shawki was banished because he expressed his love for Egypt in his poems and aroused nationalistic feelings that endangered the British occupiers and the enthroned Khedive; they feared the poems may incite the Egyptians to revolt against them. Our beloved Egypt belongs only to those who love Egypt; they have the right to live inside Egypt or to visit it as many times as they like if they live elsewhere; typically, tyrannical regimes in all eras chase away those who love Egypt and seek to introduce religious and political reform. The Quran does not mention any details about how Moses journeyed from Egypt to Madian in order to flee from Pharaoh: "And a man came from the farthest part of the city running. He said, "O Moses, the authorities are considering killing you, so leave; I am giving you good advice." So he left, fearful and vigilant. He said, "My Lord, deliver me from the wrongdoing people." As he headed towards Madian, he said, "Perhaps my Lord will guide me to the right way. "And when he arrived at the waters of Madian, he found there a crowd of people drawing water..." (28:20-23). In contrast, the Quran mentions repeatedly the details of the return of Moses to Egypt accompanied by his wife; the Lord God spoke to Moses within the burning bush in the Valley of Tuwa which is very near to Mount Al-Tur in Sinai, Egypt, and commanded him, as a messenger of the Lord, to go to Pharaoh, as we know from the following Quranic verses: "When Moses had completed the term, and departed with his family, he noticed a fire by the side of Mount Al-Tur. He said to his family, "Stay here, I have glimpsed a fire. Perhaps I can bring you some information from there, or an ember from the fire, that you may warm yourselves." When he reached it, he was called from the right side of the valley, at the Blessed Spot, from the bush: "O Moses, it is I, God, the Lord of the Worlds. Throw down your staff." And when he saw it wiggling, as if it were possessed, he turned his back to flee, and did not look back. "O Moses, come forward, and do not fear, you are perfectly safe. Put your hand inside your pocket, and it will come out white, without blemish. And press your arm to your side, against fear. These are two proofs from your Lord, to Pharaoh and his dignitaries. They are truly sinful people."" (28:29-32); "When Moses said to his family, "I have glimpsed a fire. I will bring you some news from it; or bring you a firebrand, that you may warm yourselves." Then, when he reached it, he was called: "Blessed is He who is within the fire, and He who is around it, and glorified be God, Lord of the Worlds. O Moses, it is I, God, the Almighty, the Wise. Throw down your staff." But when he saw it quivering, as though it were a demon, he turned around not looking back. "O Moses, do not fear; the messengers do not fear in My presence...Put your hand inside your pocket, and it will come out white, without blemish - among nine miracles to Pharaoh and his people, for they are sinful people."" (27:7-12); "Has the story of Moses reached you? When he saw a fire, he said to his family, "Stay; I have noticed a fire; Perhaps I can bring you a torch therefrom, or find some guidance by the fire." Then, when he reached it, he was called, "O Moses! I am your Lord. Take off your shoes. You are in the sacred valley of Tuwa." (20:9-12); "And what is that in your right-hand, O Moses?" He said, "This is my staff. I lean on it, and herd my sheep with it, and I have other uses for it."" (20:17-18). This means that Moses returned to Egypt through Sinai; he temporarily left his wife and cattle in a dark night to look for a fire as a source of light and warmth; he wore footwear and had to remove it as per the Lord God's command; we infer also that before he left Madian with his wife, his father-in-law gave him sheep to drink milk and eat meat. This is how Moses returned to Egypt. By the way, this idea you dislike is on the favor of Quranists; in fact, Quranists are less than 0.001% of those 1.5 billion people of today's world labeled as 'Muslims', let alone the percentage of Quranists in relation to the world population. Of course, you (like all of the human beings living on earth) have the freedom of choice; you can choose to be among the minority of monotheistic winners in Paradise or the vast majority of disobedient, disbelieving losers in Hell. You should not forget that this sign/miracle granted to Moses was beyond the scope of knowledge available at that time; Moses would put his hand inside his pocket and take it out for others to see as very white and shining – not the whiteness of any ailment of leprosy. Besides, his hand would return to its normal color soon afterwards. This is a breath-taking, awe-inspiring miracle/sign and you (and other human beings) cannot repeated it; do not mock it or take it lightly; it has dazzled the eyes of the Egyptians of the Pharaonic era who believed in magic. Dr. Mansour and Abou Hanifa! Our ideas will not be lost in the modern age; they are preserved within our website in Arabic and in translations. The cyberspace, democratic open-mindedness, telecommunications, and technological advancement help preserve and spread Quranism. During the era of Abou Hanifa (who died in 150 A.H.), there was not a strong tendency to write down any books of any type by anyone. Some of his disciples wrote his words and views. Hence, Abou Hanifa wrote no books at all; only oral traditions of ideas and fatwas; some of them are falsely attributed to him as they contradict other known, repeated, genuine views by him. This means some disciples who betrayed him attributed to him things he never uttered; this betrayal occurred to Prophet Muhammad after his death; he never uttered even a single hadith, you know. Our Quranist ideas of political and religious reform spread in the Arab world slowly but steadily; they are undermining the stances of clergymen of the Muhammadans and their tyrannical rulers. Besides, we do not care if the Quranist trend ended or spread more after our death; we strive for the sake of pleasing our Lord God by showing others what True Islam (i.e., Quranism) is, while hoping to be among the winners in Paradise in the Hereafter. The Lord God says the following in the Quran: "As for those who believe and lead a righteous life - We will not waste the reward of those who work righteousness." (18:30). In fact, politically, nothing has changed in Egypt in its millennia-old history from the very first pharaoh/tyrant until now. Egypt is the first and oldest State on Planet Earth in the political sense; the main features of the Egyptian State has remained as the same for the last 7000 years. These features include a ruling tyrant/pharaoh, military armies/troops, viziers/ministers, merciless policemen, the obsequious clergymen class, and low- and high-rank governmental employees and officials. Thus, there is always a majority of a submissive nation of ordinary, impoverished, unarmed, helpless people juxtaposed to the affluent minority in the ruling circles. There were tyrants/pharaohs deemed as clever and good and others who were evil and failures. Yet, all tyrants/pharaohs of the 7000-year-old Egyptian State oppressed the nation through the usual tools: viziers, clergymen, high-rank officials, policemen, etc. This is the basis of the so-called 'stability'; in some instances, revolts were initiated by the Egyptians; yet, 'stability' is reintroduced by the intervention of the military troops and soldiers and the police forces. Thus, the Egyptian State has remained as it is while other political entities and states emerged and vanished/dissolved in the Levant, Iraq, and North Africa. Of course, there are tyrants/pharaohs outside Egypt who follow the footsteps of Egyptian tyrants/pharaohs; yet, they emerge and disappear. This is the major difference between history of Egypt and the history of the rest of the world. Yes, of course. The divine command issued to all angels, sans exception, to prostrate before Adam; Gabriel obeyed this command of the Lord God, whereas the only angel who disobeyed the Lord God is Iblis who was, as a punishment, turned into one of the jinn; i.e., Satan the Devil, and was expelled from the Upper Realm; Satan and other devils and jinn cannot pass through the first heaven of the universe. The arch-angel Gabriel is the Holy Spirit; his missions include breathing human souls into human bodies (and he did so to Adam and Jesus), conveying the divine revelation (i.e., Book or Scripture) to prophets/messengers, granting comfort and calmness to prophets/messengers and believers with them, and descending with preordained fates every Ramadan during the Night of Decree, along with angels under him. We know from the Quran that Gabriel is the leader of other angels; he will lead rows of angels on the Last Day; they will never speak on that Day unless with the Dominant Lord God's permission. The Lord God says the following in the Quran: "O Prophet! We have permitted to you your wives to whom you have given their dowries, and those you already have, as granted to you by God, and the daughters of your paternal uncle, and the daughters of your paternal aunts, and the daughters of your maternal uncle, and the daughters of your maternal aunts who immigrated with you..." (33:50). In the classical Arabic tongue, within its eloquent style, the singular form of ''uncle'' (paternal or maternal) refers to the plural form as well. One should never obey any mortals by disobeying the Immortal Lord God. This marriage must end in divorce or self-repudiation (i.e., Khul'e [in Arabic] or wife ransoming herself https://en.wikipedia.org/wiki/Khul%27) if the husband would not repent and insist on forcing you to commit the sin of fornication; you can threaten to scandalize him if he does not repent and still refuses to divorce you. There is no contradiction at all. The verse 33:6 does NOT apply to all believers in all eras; it refers figuratively to the fact that believers who were contemporaries of Muhammad were not permitted to marry his wives after his death; Muhammad's wives were not allowed to marry at all once they are widowed. This has nothing to do whatsoever with the verse 58:2 at all. That Satan the Devil whispers evil inspirations to his allies is an undeniable Quranic fact. We cannot pose questions about (or add guesses or details to) the Quranic aspects of the metaphysical realm of the invisible and of the past. Thank you for sharing your story with us here; at first, you have bought a diamond-encrusted pearled box of jewelry only to find filth/dung inside it instead of finding a rare ruby; after throwing this filth into the dustbin, where it belongs, you have searched and found a real diamond/gem which needed to be polished; you have polished it to perfection and it brought you real happiness, warmth, and light into your life. May the Lord God bless you and your wife and children. Your excellent piece of advice, based on first-hand experience, should be heeded by all bachelors who intend to get married; the decision to marry is not easy nowadays; marriage affects one's lifetime forever either negatively or positively; young men must not be hasty in choosing their wives and should not be deceived by good looks of young women. In many cases, good looks are a snare.